I tend to be a bit of an extremist. I either really love something or really don’t (hate just seems much too strong of a word for a blog). This extremist attitude seems to transcend all areas of my life from activities to places, even food. When I find something I love I develop a passion for it, maybe even a bit of an obsession. Just ask my dear husband, who claims I tracked him down (lovingly) for years before we said I do. Passion is just one of those things in life I am blessed with in abundance. In the food arena, I have strong passions, strong loves, such as: fresh herbs, Swiss Chard, grass-fed cheese, and rich, golden butter. I must have these! My kitchen is a happy place with these foods present. I also tend to go the opposite extreme. There are foods that I really don’t love. Please, don’t ever show them to me, bring them in my house, or mention them. Beets and Brussel Sprouts have topped this list for years. It’s a limited list, but it does exist. 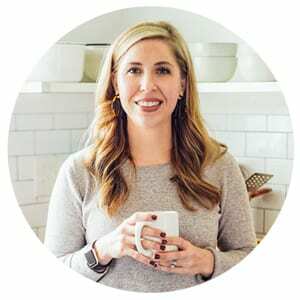 Since turning to real food (read more about our journey), I am slowly opening my heart to a few of these hated unloved foods. Cutting out processed food gave me a new desire to try new real foods, explore, and create. 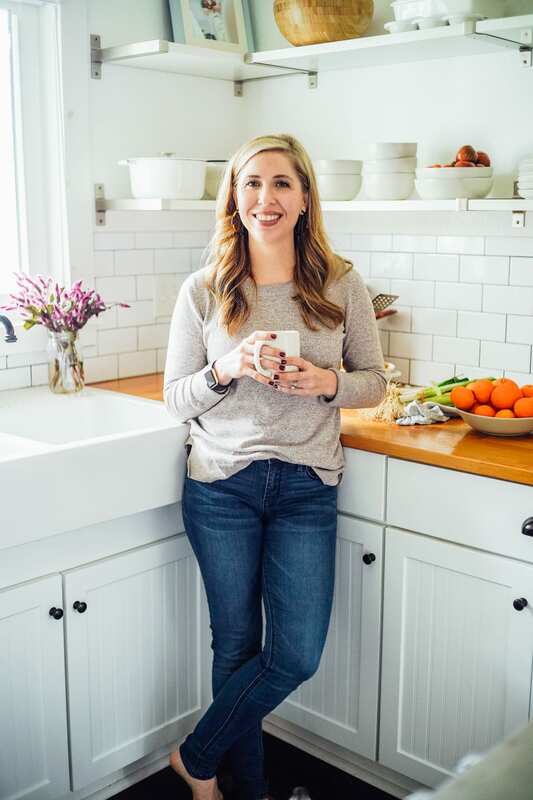 I am learning that many of my “don’t-go-there-foods” really are delicious when prepared well and many are slowly crossing the line to the “I-love-you-foods”. Beets have slowly crossed their way over to the love side. As I shared in my beet smoothie recipe, I have found a new love for beets this year. I am not sure why I always dreaded the root vegetable. I now regularly purchase pounds of beets, joyfully bring them into my home and prepare them in my kitchen. I have a passion for beets! Since I tend to be an extremist, a new love for beets means we eat them a lot. I have gone as far as putting beets in pancakes, cakes, and breads. This new beet love might even border on obsession. At least my liver is happy, healthy, and cleansed. All this passion talk to tell you today I am sharing one of my favorite beet recipes. A recipe that screams I am an American. A chip recipe. But these chips are a far cry from the store-bought bags on grocery store shelves. 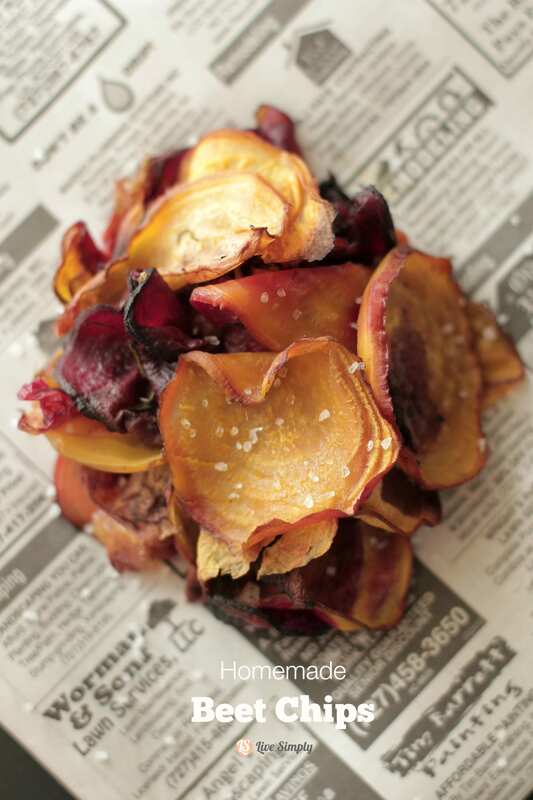 Beet chips are a delicious healthy snack. A snack that takes less time to make than a trip to the store for that bag of well-preserved potatoes and boasts loads of health benefits and flavor. 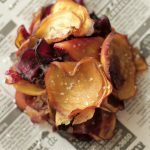 Beet chips are a delicious healthy snack. A snack that takes less time to make than a trip to the store for that bag of well-preserved potatoes and boasts loads of health benefits and flavor. Assemble ingredients, mandoline, a large bowl, and a baking stone. Cut the tops and tails off the beets. No need to peel. 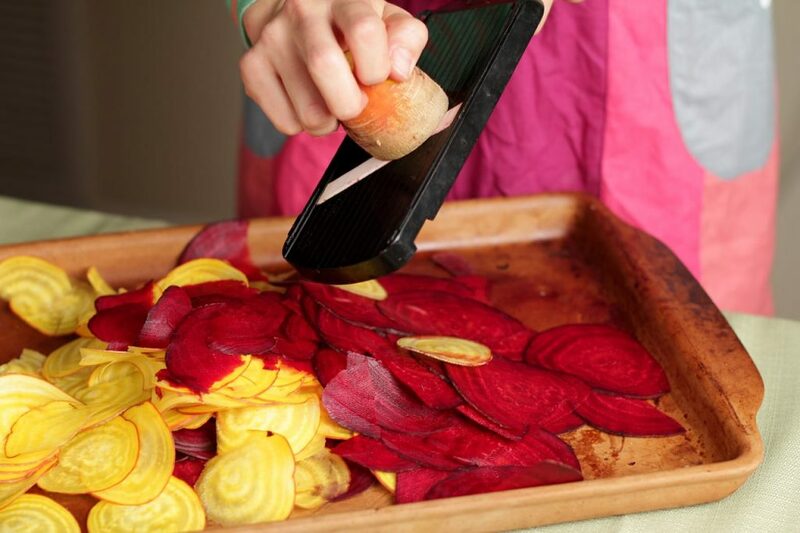 Slice the beets with the madonline (like this). I use 1/16 inch setting. 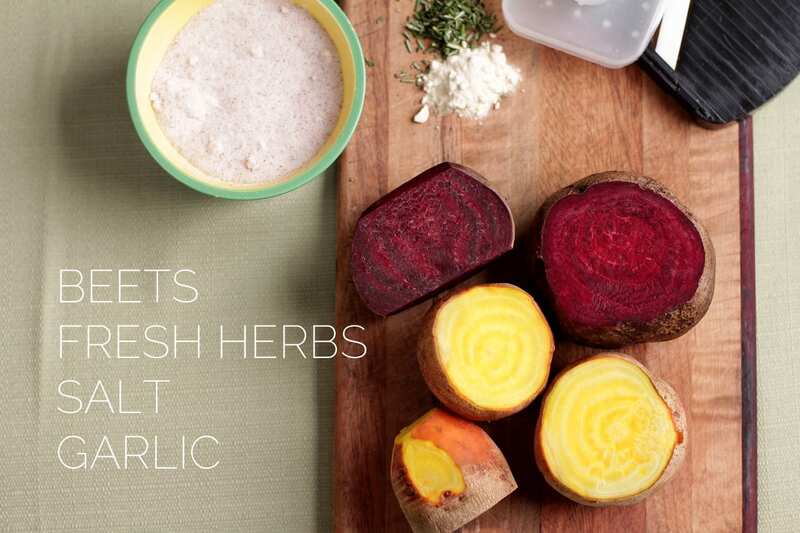 In a large bowl, toss the beets with a pinch or two of salt, garlic powder, and a few sprinkles of fresh rosemary. Add in the chopped fresh garlic and about a teaspoon of coconut or olive oil. 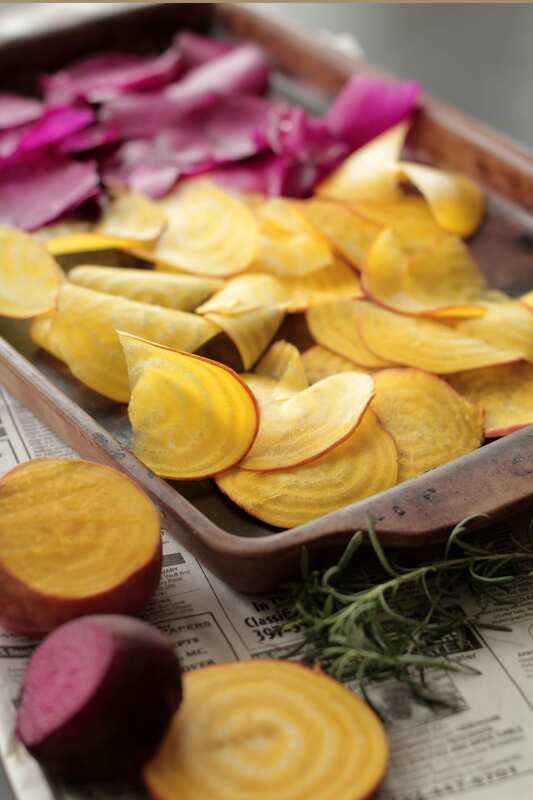 Spread the beets on a baking stone (this is what I use). 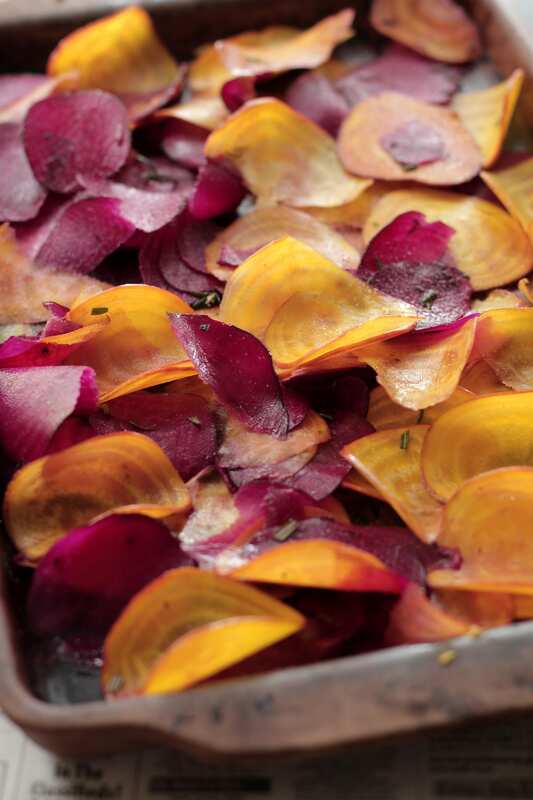 You want each beet slice to be touching the stone, one single layer of beets. If the beets are piled on top of each other they will not get crispy. Bake in the oven for 20-25 minutes until crispy. If you desire a crisper chip, you can fry the beet slices in 1/4 cup of coconut oil on the stove top. Fry the beets for a couple minutes on each side. Remove from the oil and place on a paper towel. 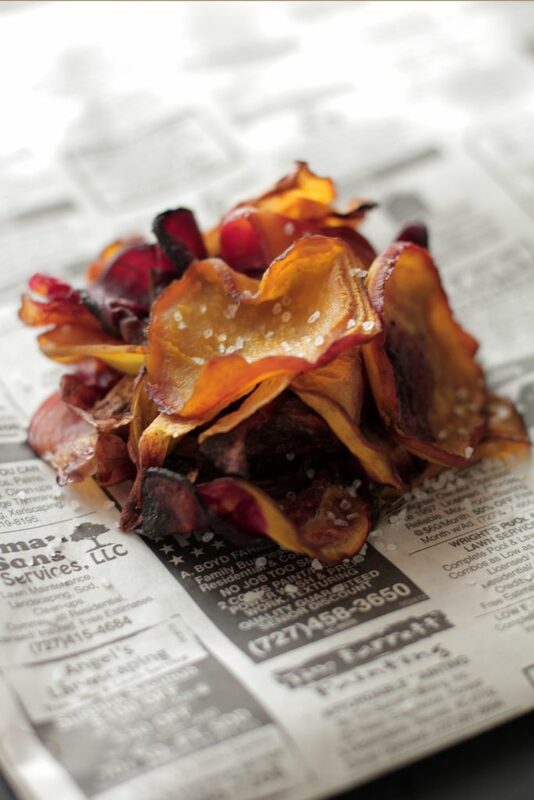 Note: If you desire a crisper beet chip, you can fry the beet slices in 1/4 cup of coconut oil on the stove top. Fry the beets for a couple minutes on each side. Remove from the oil and place on a paper towel. I don’t have a baking stone. Can I cook these on a cookie sheet or baking pan? The one thing I miss since going ‘real food’ is chips. I was never a sweet eater, but love chips. I also love beets so would like to try these.